Mix the ingredients for the lobster salad together and chill in the refrigerator. Heat olive oil at medium heat. Slice tomatoes to 1/3-inch rounds. 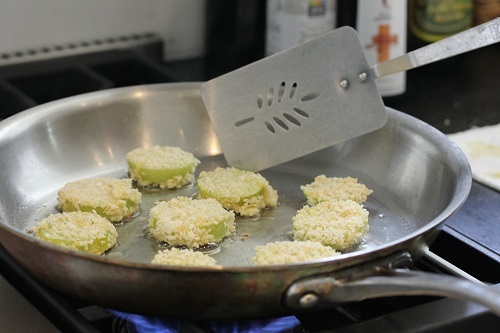 Dredge lightly in flour, dip in egg and then in panko breadcrumbs. Pan fry until golden brown and place on paper towels to drain. 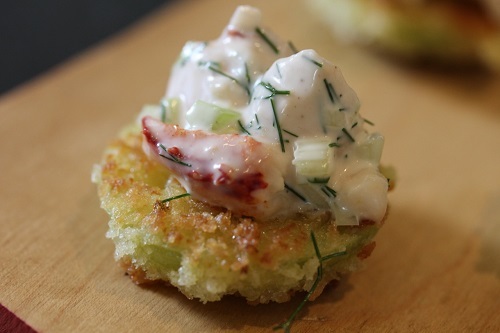 Top each green tomato with a spoonful of lobster salad, and garnish with lemon zest. The Best Granola Bars Ever!